Keep checking back as I will update this page periodically. At 7:59 AM on December 26, 2004 the island of Sumatra in the Western Pacific Ocean was struck by the second largest historic earthquake and a tsunami that killed 283,000 people, or 2.5x the current population of McKinney. It measured 9.3 on the Richter (Ml) Scale and 9.0 on the Moment Magnitude (Mw) Scale. Note that last statement. The first scale you have probably all heard before, but why do we have/need two scales that obviously measure things differently? What do they mean? The Richter Scale was developed by Charles Richter as a way of measuring the intensity of an earthquake. He looked at the lines recorded on his seismograph (like the one used in class) and created a scale based on the most intense energy (i.e., the amplitude or biggest movement of the pen) released during an event. He scaled it on what we call a logorithm scale. Each whole number increase in his scale represents a tenfold increase in the recorded amplitude. This means that if he recorded a earthquake with a magnitude of 1 which caused the pen to move an inch from center, a 2 would cause the pen to move 10 inches from center. Each whole number increase corresponds to about 31.6 times the energy of the one before it. See the picture at right for a scaling of earthquake magnitude and equivalent energy released. The problem with his scale is that for earthquakes above magnitude 6.5, they saturate the machine causing the pen to swing so wildly, it is hard to get an accurate picture of how much the pen moved. A new scale was therefore needed. The moment magnitude scale is based on the total energy expended during the quake and not just the peak of energy. We can calculate this by looking at the total area affected by the quake (before the waves dissipate) and the total movement along the fault. This is a more tedious and yet more precise calculation. The scales attempt to measure the same thing, but they do it differently and so their final results are different. The media most often reports the Richter Scale value. But what caused the Sumatran Earthquake? 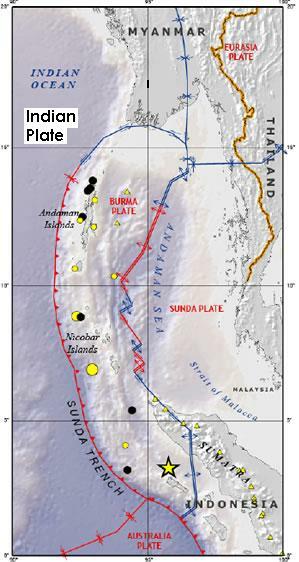 The Indian Plate subducts beneath the Burma Plate, upon which the NW edge of Sumatra rests. The Indian Plate has been subducting northeastward under the Burma Plate at a rate of about 6 cm/yr, causing nearly constant quakes. 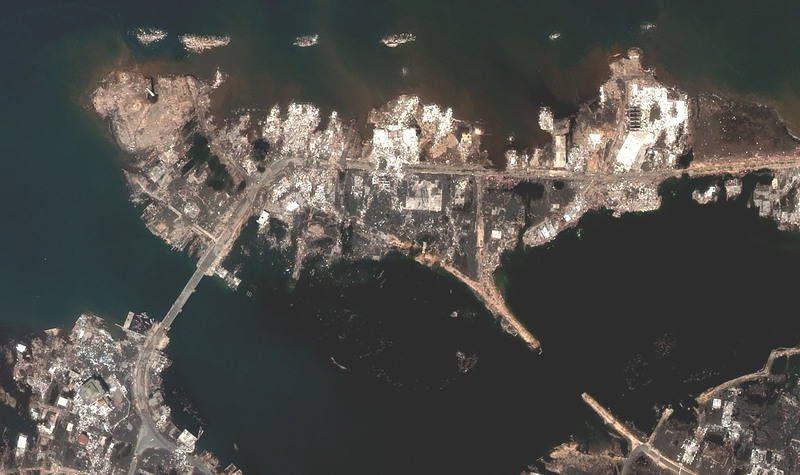 However, along a huge region of this subduction zone, the plate has been stuck for nearly 100 years, accumulating a massive amount of stress, and actually causing the Burma Plate to bend. Finally, reaching a breaking point, the Indian Plate subducted under the Burma Plate by 15 meters in just a few short moments. This caused the seafloor of the Burma Plate to rise by several meters, displacing a HUMONGOUS volume of water above it. The water rose due to the shock generated by the moving plate, and then flattened out, rushing outward in all directions. The wave traveled outward at a rate of 700 kph (420 mph). The waves hit the beach in Sumatra and in neighboring Thailand within thirty minutes - in some places, nearly instantaneous. The waves were ~10m (32’) and were 24m locally. 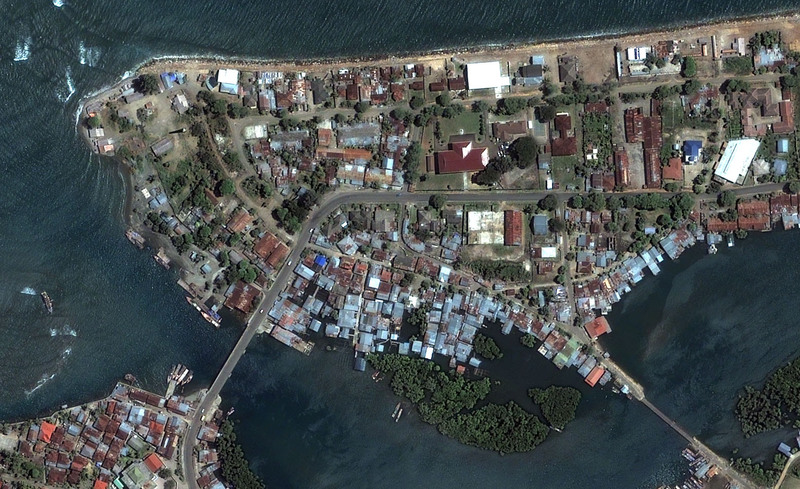 In Sumatra and Thailand, people live on the coast in homes that are usually less than 15’. These waves were therefore COLOSSAL. The sheer energy carried the waves inland between 1 and 8 km... and then the waves went back out to sea, sweeping people away, some never to be found. The unfortunate thing about tsunamis, is because of the vast amount of water displaced, the distance between successive waves (like ripples on a pond) was large enough that more than thirty minutes passed between waves. Also, just as waves retreat on a beach, they do also in a tsunami, but the distance the waves retreat can be several thousand feet. Drawn by innate human curiosity, many people - largely tourists - followed the retreating water out into the ocean to see this new amount of beach not realizing another HUMONGOUS wave was coming in to shore. Many died by being caught completely exposed hundreds of feet from the normal shore. One (true) story coming out of the region was about a 10-yr old girl that saw the water recede, remembered what she had learned about the nature of tsunamis in school, and instead of walking out with everyone else (mainly adults), turned to run inland. When the tourists heard her screaming and running the other way, herd mentality kicked in and more than 7,000 people were saved. Ah, the benefit of a good education. But why are tsunamis so HUGE? In a normal wave generated by the wind, the strongest motion occurs at the surface (at the wind-ocean interface) and the effect of the wave diminishes with depth. At a depth deeper than one half of the wavelength, you cannot feel the effects of the waves. When a tsunami is generated by displacement of water, the wavelength between successive peaks can be HUGE, say, about 180 km. 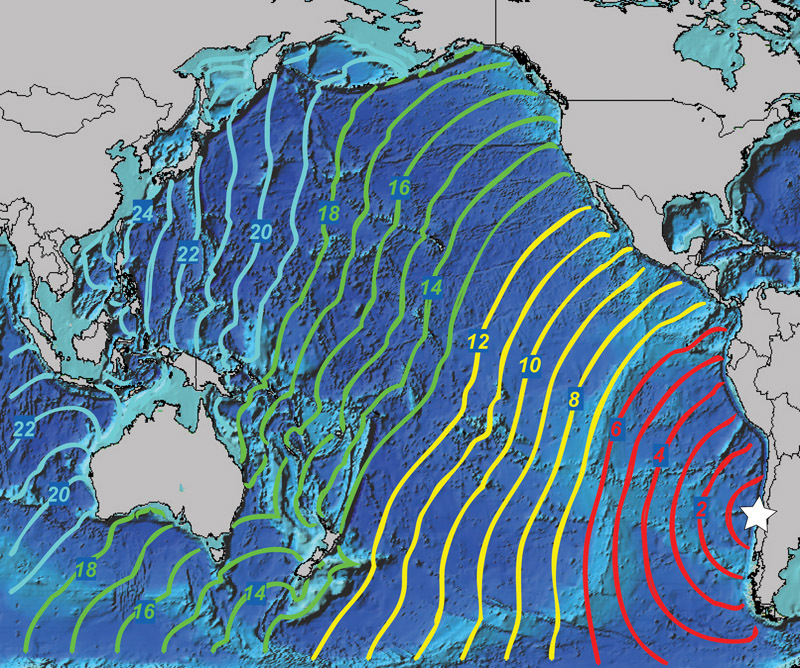 One half of the wavelength of a tsunami is 90 km (~56 miles) which is MUCH deeper than the deepest ocean... by 49 miles. So the entire ocean along the path of the tsunami feels the effects of the wave. A bottom-feeder would be moved about by a tsunami occurring 38,000 feet above it! When a wave - any wave - moves on the ocean, it causes the water through which it passes to have a circular motion. Any particle on the surface would move in this circular motion and come back to rest in its original spot. 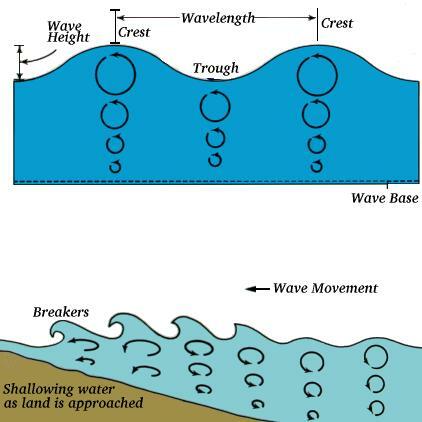 As the wave moves in to shore, eventually the "half-distance depth" to which you would feel motion of the wave would be greater than the depth of water. The normal circular motion bunches up in this too-small space forming elliptical motion. Eventually, the top of the wave moves faster than the bottom part of the wave (which drags on the seafloor). We see this as a breaking wave with a curled top. In this portion, the wavelength decreases (waves get closer together), the velocity decreases, and wave height increases. 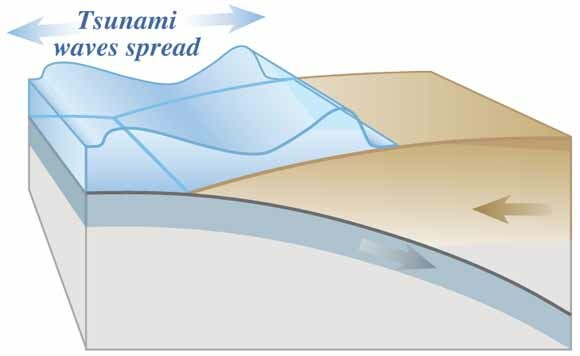 Since a tsunami is COLOSSAL and drags on the floor throughout its entire passage, its wave height is increasing the whole time to make huge waves. Check out the description on page 410-411 for more clarity. Subduction zones create the world's biggest earthquakes, because vast sections of the earth are involved in this frictional rubbing which generates earthquakes, and the earthquakes can extend to great depths. Strike-slip earthquakes tend to be more shallow with less surface area available to accumulate stress. 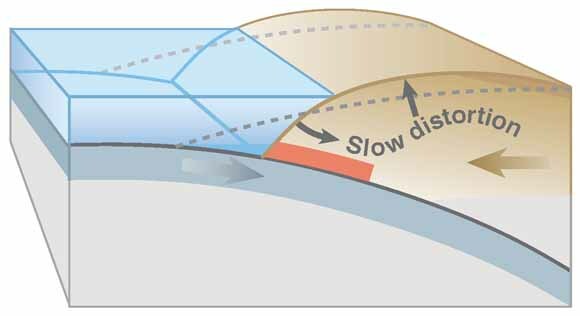 Strike-slip earthquakes occur only in the crust, whereas subduction zone quakes occur due to friction between lithospheric slabs. The fact that this is done as a sort of music video I do not support, but it is the best collection of images I can find. Comparison scale of Richter Magnitude and equivalent energy. Burma Plate bends under stress. Burma Plate releases stress, displacing water. Displaced water spreads out as a tsunami. Motion of water in ocean and the effects of the bottom. Example of a tsunami created by the 1960 mega-earthquake in Chile. Numbers represent travel time in hours of the tsunami as it passed through the Pacific. 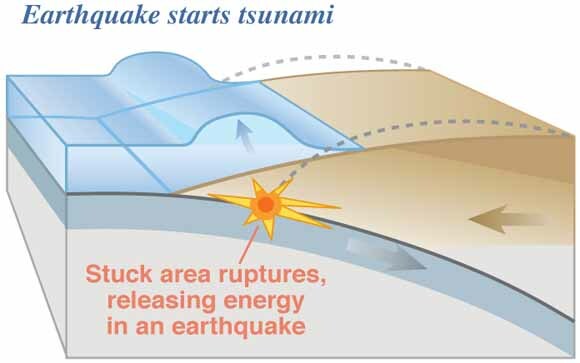 Notice how the tsunami is deflected by objects or refracted. Click on any photo for higher resolution. 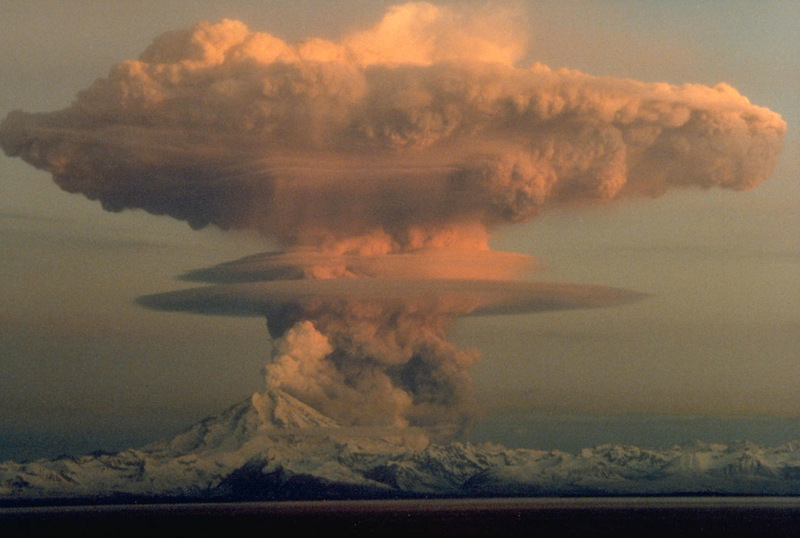 Redoubt Volcano, Alaska: A Case Study In the Unpredictability of Natural Phenomena Many of you may have heard about the "likelihood" of a volcanic eruption at Redoubt Volcano in Alaska. The Alaska Volcano Observatory (AVO), which is in charge of monitoring the activiy (eruptions, volcano-related earthquakes, ground deformation) at volcanoes in Alaska detected increasing "unrest" at Redoubt since last fall. Unrest is really defined as something outside the status quo. Imagine you observe your friend's behavior over a course of several weeks or months, and suddenly they start acting strangely, talking to walls, or walking in circles. If this is not usual behavior, you should be concerned. At a volcano, scientists monitor earthquakes, deformation of the ground, emission of gases (types and amounts), temperatures at summit crater/cracks, etc, over a course of time to characterize the volcano (like getting to know your friend). If any unusual behavior crops up, this may suggest an eruption is imminent. This is a non-exact science. Just like your friend may be acting this way because of a break-up or excess stress at work, this may simply be a temporary problem, and not necessarily indicative of a psychotic break with reality. So it is with volcanoes. A volcano may show increasing earthquake activity, ridiculously high temperatures and increased production of steam at the summit, and then "die out" without ever creating an actual eruption. But enough of generalities. In September 2008, Redoubt Volcano began emitting more hydrogen sulfide (H2S), identified originally by smell (as this smells like rotten eggs), as well as CO2 and SO2 identified by gas sensors. As magma usually contains these dissolved gases, a volcano may release more gas from the summit if magma is getting closer to the surface. At the same time as the increase in gas was reported, earthquakes of a type usually associated with the movement of liquids and gases beneath the surface were recorded at monitoring stations around the volcano. 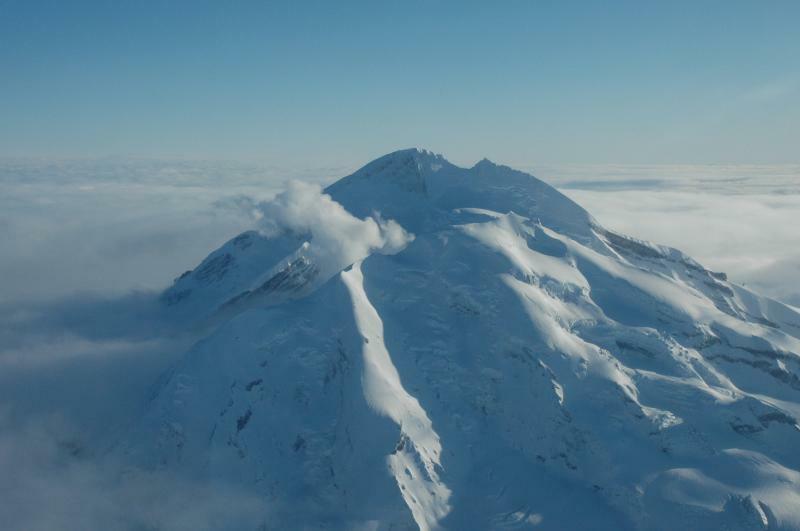 On Friday, January 23, 2009, seismic activity increased markedly at Redoubt Volcano. The type of seismic activity recorded is also usually with movement of fluids and has consistently been above "background levels." Such activity hasn't been seen since the last eruption in 1989-90 (picture at right). Increase in heatflow at the summit has produced small debris flows as the ice melts and mixes with old ash/rock. The last two eruptions of the volcano (1966-68, 1989-90) generated clouds that reached as high as 40,000 feet above sea level. Ash reached 5 mm thick in Kenai (map at right) but could be found even in Yukon Territory. What is the likelihood that the volcano will erupt? Eruptions cannot be given in more than probabilistic terms (% chance in days or weeks) with any certainty. The AVO has raised the Aviation Color Code to Orange (Green - Normal, Yellow - Some Signs of Unrest Above Background, Orange - Heightened Unrest with Increasing Likelihood of Eruption, Red - Eruption Forecast to be Imminent or Eruption is Underway). Aircraft need to be especially concerned about volcanic eruptions as ash can (and in several cases did) clog the engines of jets resulting in engine failure. 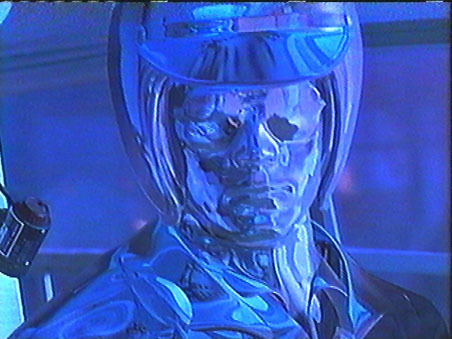 As ash is basically fine glass and powdered rocks and minerals, it acts like a sandblaster on engine blades. 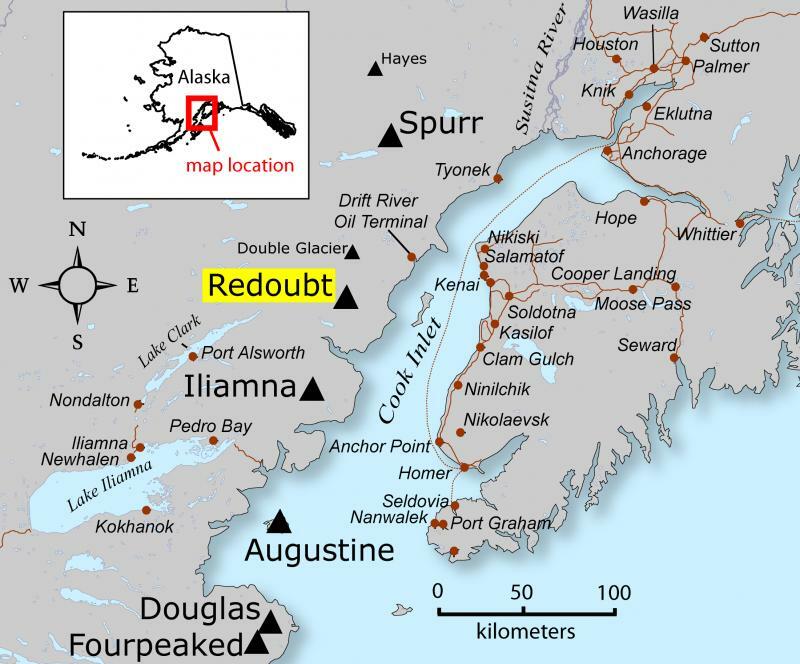 What is the most likely scenario if Redoubt erupts? Eruption clouds as big or smaller than the last two eruptions (<40,000 ft) with small mudflows down the volcano flanks. Portions of the volcano could collapse, but these would most likely be small in scale and only affect the uninhabited valleys around the volcano. It is theoretically possible (because there is no guarantee that past behavior is predictive of the future) that larger eruption clouds could be generated, or that the volcano itself could collapse as did Mt. St. Helens in 1980. Such a collapse would like generate a small to moderate tsunami in Cook Inlet. This is the most extreme case and probabilistically is the most UNLIKELY. Loss of life from an eruption of Redoubt Volcano would be minor if at all, and primarily from aircraft problems on Trans-Pacific flights or due to ash inhalation. So now we wait and see: is it a little stress, easily dealt with, or a 40,000 foot psychotic break? View from west of fumarolic activity on the north side of the volcano, associated with recent unrest. Bowen's Reaction Series: Since we talk about this in all of my classes to some degree, I figured a special explanation of this COMPLEX concept would prove useful. N.L. Bowen, early in the twentieth century, conducted a series of experiments to determine the order in which minerals would solidify from a liquid. A magma can be thought of as a hodgepodge of elements (Na, K, Si, Al, Fe, Ca, and Mg) floating around in a soup. There are a limited number of combinations in which these elements can bond together to form minerals. Potassium feldspar, for example, can only be described by the formula KAlSi3O8. No Fe, Ca, Na, or Mg can fit into its structure. Each mineral has its own temperature at which it can solidify (just like ice forms at 32F). Starting with a magma rich in Fe, Mg, and Ca (like you would find in basalt in Hawaii), Bowen began to cool the magma to find out which minerals would form at what temperatures. He would cool the magma to a particular temperature until minerals began to form, and then freeze it instantly. The minerals would be trapped in a sort of glass. In such a magma, the first mineral that formed was olivine: (Mg,Fe)2SiO4. By binding Mg and Fe in olivine, the magma glass around the olivine was somewhat depleted in these elements. If the magma was allowed to cool further, the crystals of Mg- and Fe-rich olivine would react with the Mg- and Fe-depleted liquid to form the mineral pyroxene: Ca(Fe,Mg)Si2O6. Note, this mineral has less Mg and Fe overall. If there was sufficient melt to react with all of the olivine previously formed, all the olivine would become pyroxene. The final rock would only contain pyroxene. If the magma was insufficient to completely react, the rock would contain pyroxene and olivine. As olivine is heavy, it has a tendency to settle through the magma to the base of the chamber, much like vegetables in chicken soup. If it is not stirred, it is effectively removed from any interaction with the liquid left over. The liquid is then depleted in Fe and Mg, and primarily has only Na, K, Al, and Si. Minerals rich in these elements (amphibole or biotite) may form instead. Taken to the extreme, if ALL the Mg and Fe is taken out by olivine settling to the bottom, then the next minerals to form would be Potassium Feldspar, Muscovite, and Quartz which completely lack these elements. Starting with a mafic magma, you could get either a mafic rock (gabbro or basalt) with olivine only, olivine and pyroxene, or pyroxene only. If olivine settles and removes Fe and Mg, you could get an intermediate rock (diorite or andesite) with amphibole and biotite. At the extreme, if all the Fe and Mg is removed, you could get a felsic rock (granite or rhyolite) with K-feldspar, Quartz, and Muscovite. It really depends, therefore, on what composition of magma you start with (Mg,Fe-rich or Na,K,Si,Al-rich) and what happens to the minerals that form in the magma (constantly stirred through or settle out) to determine what you end up with. The same thing works when you make soup. It really depends on what elements you put in the soup that determines what kind of soup you end up with. It also matters whether you stir the soup or let all the ingredients settle to the bottom. 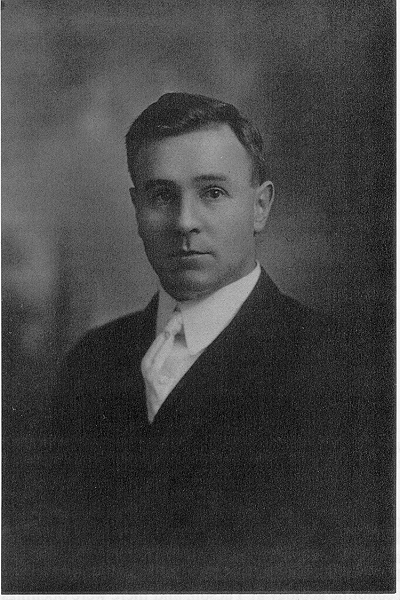 Norman Levi Bowen, graduation photograph from Queen's University, Kingston, Ontario, Canada in 1909. Mercury: Based on a student query, I figured I would post today rather than on Wednesday. 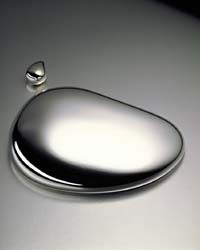 Mercury is a rare metal and the only mineral liquid at normal temperatures. Because of high surface tension (like water), it takes the form of tiny droplets. It occurs primarily in volcanic rocks or thermal fields particularly near Lucca, Italy but also in Terlingua, TX and San José, CA. Its primary uses are for the extraction of gold from rock (explained below), manufacture of explosives, in physics equipment, in old thermometers and barometers, and in industrial equipment in the medical field. Its specific gravity is 13.60, which means it is about twice as heavy as galena, the lead ore that breaks into cubes we work with in lab. It is so dense that cannonballs can float in it. It is 80 on the Periodic Table with an symbol of Hg (or hydrargyrum from the Latinized-Greek for liquid silver). Due to the major drive to harvest gold in today's society, mercury's main use is for gold extraction from a host rock. While the process is not understood completely, when pure gold is brought into contact with pure mercury, the gold "dissolves" in the mercury and forms an amalgam or alloy. This is done by introducing clean (grease/sulfides/graphite-free) gold-bearing rock chips in contact with liquid mercury. The alloy is then heated and the mercury, which has a much lower boiling point, is driven into the gas phase while the gold remains a liquid. Most of the mercury gas can be captured, cooled, and reused, although some is undoubtedly lost to evaporation or indiscriminate dumping. Twenty-five percent of the world's gold industry is conducted by family or illegal miners rather than big corporations (see January National Geographic cover story), and these miners employ mercury to harvest the gold, dumping the refuse (or by extension, breathe in the gas) rather than cooling it to reuse it as this costs money and requires some source of refrigeration. Mercury pollution from gold-mining is believed to be 100-150 tons/yr (Today's Chemist, 2001). Mercury is extremely toxic (especially as a vapor) and has been linked to many neurological disorders and physical deformities in infants (see Minamata Disease). Mercury, being liquid, can easily be transported in streams and find its way into lakes where it can be uptaken by fish. In rivers nearby a coal-generation plant in Kittanning, PA, fish possessed 3.1-19x the concentration of mercury than would be found in store-bought fish, 5-8x EPA’s acceptable risk depending on age. 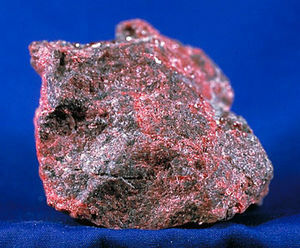 This mercury was released from burning of the host rock of the coal, though it is present in extremely low quantities. When I was a child, we used to play with Mercury. New Madrid Seismic Zone: Stretching along the Kentucky-Missouri border south of Jonesboro Arkansas (right) is an area of concentrated seismic activity that has generated two of the largest earthquakes in our nation's history (#7 and 9 of top 10 since 1700). On December 26, 1811, the area surrounding New Madrid was struck by an earthquake with moment magnitude (Mw) of 8.1 at ~8AM. (Moment magnitude is similar to but more accurate than the Richter scale.) Movement occurred along faults in the New Madrid Seismic Zone (NMSZ). The seismic shaking affected such a large area that it toppled chimneys in Ohio, Alabama, and Louisiana and rang churchbells in Boston more than 1700 km (~1050 mi) away. The earthquake caused fissures to open in the Mississippi River, churning the water (generating massive ripples) and giving the river the appearance of flowing upstream. The waves overwhelmed many boats, washed others onshore, and made whole islands disappear. On February 7, 1812, a second mega-quake (Mw=8.0) struck the same area, stemming from movements along the NMSZ. Aftershocks occurring throughout this period usually had Mw=6.0-7.0, and one earthquake on January 23, 1812 may have reached Mw=7.8, bigger than all historic quakes along the San Adreas Fault except the great quake of 1906 in San Francisco. What is the cause of this area of earthquake activity? We will discuss plate tectonics later in the semester, but simply, the continent tried to split apart along the NMSZ about 750 million years ago and again at 200 mya and failed both times. This left the continent weak, crosscut by many small faults. If North America could be thought of as a car, these faults are weak spots in the structure of your car that groan as you go around a turn, causing the car to shudder. As North America is moving west compared to Europe (again, plate tectonics), it is groaning during its movements. How likely is it for a major earthquake to occur again along the NMSZ? Based on careful analyses of old rock layers disturbed by previous movements of faults in the NMSZ, there is an estimated 7-10% chance of a Mw=8.0 earthquake along the NMSZ in the next 50 years (or by about 2060) over an area 10x that affected in the great San Francisco quake of 1906. While those are good odds in favor of no earthquake, the potential risk to an area that sports many major cities (Jonesboro, Memphis, St. Louis) is colossal. Many changes to building codes and evacuation plans are already under way in the region because lawmakers are convinced that the NMSZ represents a credible threat. Consider the number of earthquakes (though most are too small to feel) that have occurred along the NMSZ since 1974 (bottom right)! Watch a USGS produced video of the New Madrid seismic zone here.